In today’s passage we read about Queen Athaliah, her grandson Joash, and the priest Jehoiada. Here’s their story. Athaliah’s son Ahaziah is King. As with most mothers, she influences her son. But she doesn’t have a positive impact on him. Instead she encourages him to do what’s wrong, to behave badly. He does. When he’s executed, Athaliah takes control. She kills the royal family, which includes her children and grandchildren. Then she sets herself up as Queen, with no one in the royal bloodline to challenge her. She rules for six years. However, one baby escapes her purge, her grandson Joash. He’s secreted away by his aunt, Jehosheba, who’s married to the priest Jehoiada. Together they protect baby Joash. When he’s seven, they orchestrate a coup against Athaliah and kill her. Then they make Joash King. He does what God says is right. He’s a good king—at least at first. In this story we have Queen Athaliah who influences her son to ignore God and embrace evil. We also have Jehoiada who has a positive influence on King Joash, but when Jehoiada dies, Joash waivers and does evil. 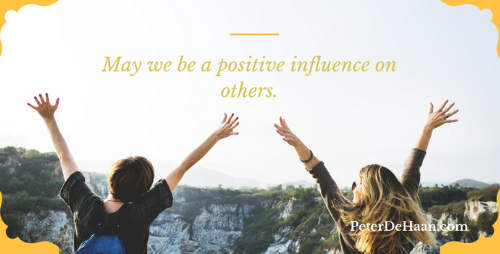 May we have a positive influence on others. And may we seek to surround ourselves with those who have a positive influence on us. Prabhakar, may you continue to be a positive influence on those you meet.